To set default browser, the steps vary for XP and Windows 7. Click ‘Start‘ and then select “Set Program access and defaults“. If this is not listed in the start menu then go to Control Panel -> Add or Remove Programs and then select “Set Program access and defaults” in the left side menu. Now expand the Custom node. Now choose the desired browser among the options listed under ‘Choose a default web browser‘. We can also set default email program and default messenger application using the above interface. 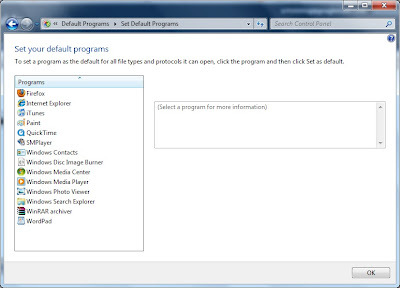 In Windows 7 we can configure default browser as follows. From the list of programs displayed in the left side menu select the browser application which you want to use as default application for opening web links or HTML pages. After selecting the application you will see Set this program as default in the right bottom of the same window. Click on it and the application will be made as the default program.